Semolina or the cream of the wheat is a common and popular ingredient in the Indian cuisine. There are a variety of sweet and savory dishes that can be made with semolina. Upma is one of the popular and commonly cooked breakfast dish made with semolina and spices. 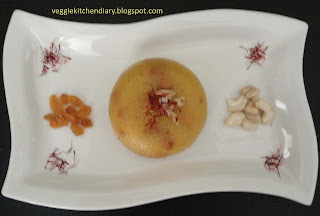 Rava Laddu Suji Semolina, Sweet Semolina Poori (stuffed poori with semolina) and Sooji Ka Halwa ,(Semolina Pudding) are some of the popular sweets or desserts made regularly during festivities and feasts. Rava Kesari with shrikhand is a very popular breakfast combo dish that is appetizing and delicious. This variety is often served in most of the restaurants in Karnataka. Generally fresh pineapple pieces are added to rava kesari which enhances the flavor and taste of the sweet dish. Sheera with poori is popular in northern region of India. Rava Kesari is a typical south Indian sweet dish made with semolina also commonly known as Bombay rava or sooji. Rava kesari is also popularly known as Sheera in north Indian region. Made with cream of wheat (semolina), milk, ghee, sugar and nuts, the rava kesari is flavored with cardamom powder to make it aromatic. Rava kesari is always served as the sweet dish during wedding breakfasts. 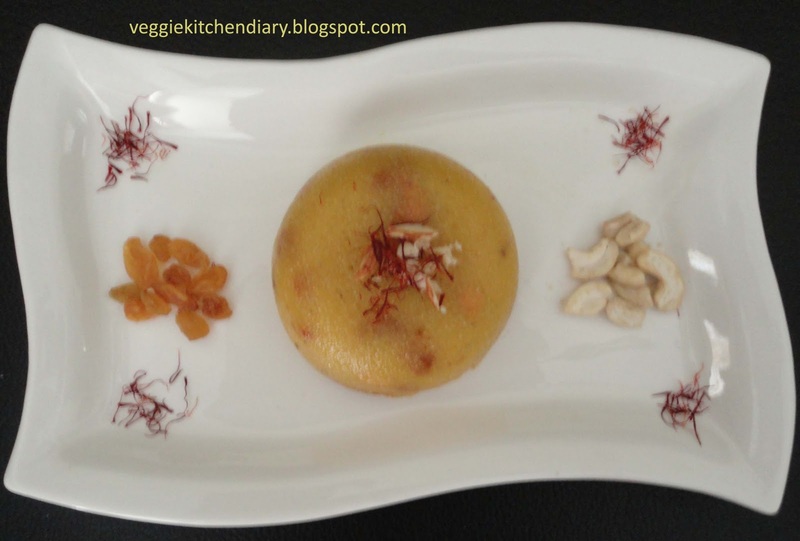 Kesar or saffron is added to this pudding to give it an excellent flavor and beautiful colour. As saffron is very expensive and is not affordable by one and all, hence Food colour orange / lemon yellow color is added for getting the same effect. A perfect rava kesari should be soft in texture yet hold its shape and should just melt in the mouth; having full aroma and fragrance of ghee. Rava Kesari is made colorful with kesari (saffron thread) hence the name rava kesari. This enhances the flavor and color of the dish. This Indian dessert is a dish full of nutrition as it’s made with ghee, milk and garnished with nuts. Rava kesari is a soft, smooth halwa or pudding made from semolina (rava), milk (or water) and lots of ghee. It is traditionally served slightly warm, but tastes equally good chilled. When served warm, the kesari has a soft, which almost melts in the mouth, texture though it becomes slightly more solid and sets a bit if refrigerated. In most south Indian homes, this sweet is also made on non-festive days as an ordinary everyday kind of sweet dish as well, as the ingredients are all commonly available in most kitchens. Do try this simple and delicious recipe. !!!! Bombay Rava /Semolina /Sooji - 1 cup. Water - 2 1/2 cups. 1.Heat 1 tsp. of ghee in a frying pan and add rava to it and fry till the fresh smell of the rava goes off. 2.In a pan, heat the water and bring to a boil. 3.Keep the roasted rava aside. Prepare the saffron by rubbing it in 1tsp warm milk until the milk turns orange. 4.Heat the 1tsp of ghee and fry the cashew nuts until golden brown.Remove cashew nuts and set aside. 5.In the same ghee, add raisins.As soon as they puff up,add the semolina.Now add the sugar and boiling water and allow to cook on a low flame ,stirring continuously to avoid lumps.Stirr till the mixture becomes thick. 6.Add the saffron liquid,fried cashews cardamom powder and let it simmer for a minute or two. Switch off the flame as soons as the mixture starts leaving the sides of the pan. 7.Garnish withs Saffron springs and cashews and serve hot or cold.